With Christmas around the corner I thought I’d share three accessories that I’ve found to be just as essential as my lighter and cutter. If you are a loyal reader of Week in Smoke or if you use the Hewitt Method (you just look at the pictures) you’ve probably noticed them in the background. Some of you may not think these are ‘practical’ accessories and thats fine. I’ll be honest with you, I didn’t think so either at first until I actually started using them and found how useful they really are. I think all of these would make for some great stocking stuffer items for that fellow cigar passionado. Humidor Notes ($13/3-pack at http://humidornotes.com/) – There are three things that I really like about Humidor Notes. The first is it’s size. Unlike the old school Cigar Journal that sits on your bookshelf or a thick pocket bible sized alternative, Humidor Notes is compact enough to fit comfortably in your shirt/suit/pant pocket or even in your trusty travel humidor. The second is the included glue dots so you can easily and neatly insert your bands. No more messing with tape or stealing your kids glue stick and making a mess everywhere or having pages stick together. 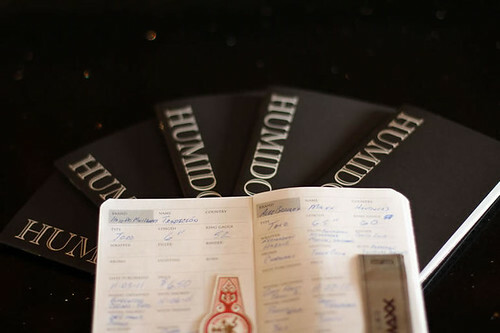 Humidor Notes has everything you need to capture your experience as you smoke and not having to wait till you get home and the details are fuzzy or you’ve lost the band. The third thing I love and retailers love about Humidor Notes is that it helps your retailer out. I don’t have enough fingers and toes to count how many times someone walks into a shop trying to describe a cigar they are looking for…”its a cigar by Hecho a Mano” or “it has a red label and came in a wooden box”. Trust me, your memory isn’t as reliable as you think. There is something therapeutic, old school and enjoyable about writing with a pen as opposed to launching an app to do this. Its also cool to exchange Humidor Notes while sitting at the cigar shop and seeing what others have been smoking, their thoughts and discovering a cigar you’ve never heard of. Siesta by Custom Ash ($24.99+ at http://www.customash.com) – A new addition to my accessory mix is the Siesta cigar stand by Custom Ash. Honestly, when I got this, I was certain I would never use it. When would I use a cigar stand to rest my cigar when there is always an ashtray nearby? “Always” and “Never” are two funny words. Once you use one of them you start to find a lot of exceptions like sitting at a park bench while your wife gets her hair done, a family member’s backyard, a cigar event that doesn’t have enough ashtrays or the ashtray only accommodates two cigars or the truly bizarre where there are only small cigarette style ashtrays. I’ve used mine a lot at my local shop during events when it is standing room only. I’ve been surprised by how much I’ve used my Siesta when I swore that I’d never be in a situation where it would come in handy. Lite weight, portable and sturdy. Stogie Review Travel Humidor – I’m pimping the Stogie Review Travel Humidor by Xikar that is only available via giveaways here on Stogie Review. 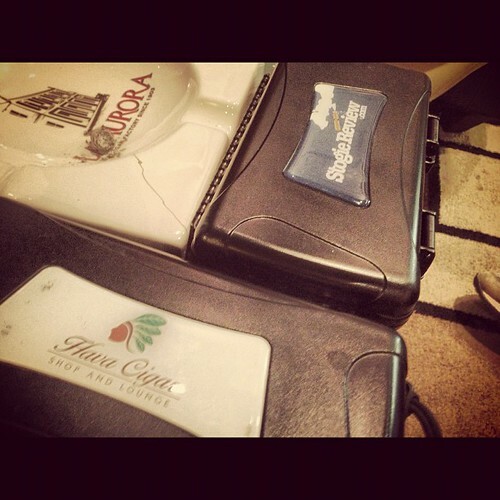 There are several brands, sizes and other variations to a travel humidor. Regardless of what brand you use there are some things to look for like a good, air tight seal, proper padding to keep your cigars safe, for those that fly a lot, a pressure release valve so you don’t do what I do and throw your travel humidor onto the floor until it opens. I don’t fly as much as I use to nor do I go off road in my Jetta but my 10 count SR Xikar Travel Humidor is the perfect companion to safely carry the above two accessories, a Boveda pack for humidification and a few cigars to enjoy/trade at the shop and a little room to bring some treats home. Here is an incredibly stupid question…. where are the glue dots in the Humidor Notes? I have a pack that you gave me from IPCPR and got annoyed by having to track down tape or a glue stick. It eventually lead to me tossing the book aside and not using it again. I had no idea they included a way to adhere the band to the pages. I’m in need of a cigar holder for shooting matches and was planning on picking up another Xikar Ash Can (I have one in my car – it has pros and cons) to keep in my range bag. Maybe the Siesta is worth looking into. that cigar holder is neat, i still have not used the humidor notes due to me still relearning how to do things with my left side lol. and the traveldor is going to get used really good this summer at the beach!!! nice write up! Hmmm…Glue Dot packet should be at the back of the Humidor Notes in a sleeve. If not, I’ll send you another but each one comes with a sleeve full of them. To be honest, the only cigar related app I have on my phone is the Perelman’s Pocket Cyclopedia from 2010. I don’t know if the app is available but surely it hasn’t been updated since 2009. 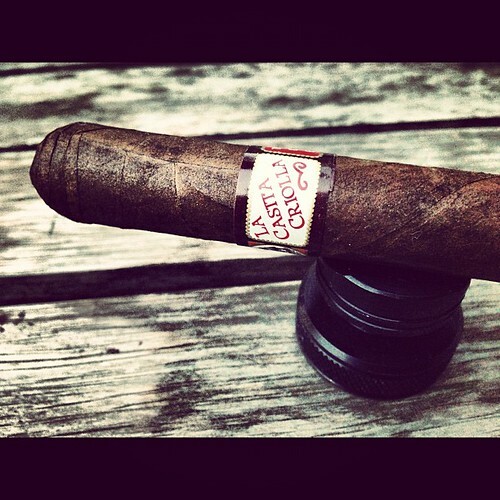 Funny, outside of Instagram, I don’ use my phone much for cigar purposes. When I’m sitting in the shop I’m having a conversation with someone, or learning something from George, Twitter, Facebook but nothing that really ‘enhances’ (not sure that is the right word) my smoking time. I’ll have to check the back of the book. I can’t say that I’ve ever flipped to the end to see what was back there. I thought you mentioned before that you were using an app to track something. Maybe this was before you started using the Humidor Notes? Yeah there was an app a few years ago that I used to track everything from cigars, to beer to even cheese. It was a multipurpose type app that I got tired of not finding whatever brand, size, extension in their ‘vast’ database that I dropped it. I gotta say, I agree with Walt..not a single app? And nice way to pimp a product we can’t buy? Man did you see the ashtrays that Custom Ash has on their site? Those look sweet. How many pages are in a Humidor Notes? What do you do with your finished Humidor Notes? Do you find yourself ever going back and looking at them? Kevin – There are many other Xikar or other branded travel humidors out on the market that you can easily purchase. If you want a SR one, you have to win it. I use to use an app a few years ago that was a general tracking app you could use to track cigars or beers or wine but that was years ago and took too much time to enter ‘new’ cigars into the database. As for old Humidor Notes, I do go back and look at them to see how a particular cigar performed the last time I smoked it or if I’m looking for a detail about a cigar that I can’t find online but wrote down in my notes. Nice write up guys, I don’t have the Humidor notes but I’m long over due to get a pack. I keep notes on the wine I drink. I was lucky enough to get a SR Travel Humidor and I love it (thanks again) I normally use my Palio cutter as a sudo-holder but I was gifted a while back one of those fold up X type holders but to be honest I never use it seems kinda silly to me. Happy Christmas and a Merry New Year to all the Men over at SR and also to Mike. As far as apps, what I’d like to see is a cigar equivalent of Untappd. I’ve not found a cigar app that is particularly useful otherwise. That Xikar V-cutter makes a nice holder, too, similar to a Palio. And I always that with me, so no need to pack another thing in the case. Jerry, I’ve been eyeballing the Xicar portable ash tray can for those times when I decide to smoke at 60 mph. Old Starbucks coffee cups are ok but be nice to drink coffee while driving and smoking.